One of the parents in my son’s kindergarten class made these awesome dragon cupcakes for her son’s birthday. 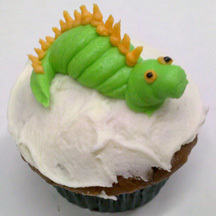 (They could also be dinosaur cupcakes, with spikes for a stegosaurus, etc. 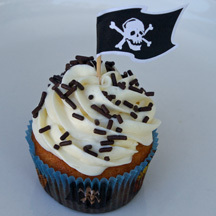 Or, pair them with pirate cupcakes for an all-out boy theme.) She told me she used two different metal tips: a larger one to “flow” the dragon’s body and a smaller one. 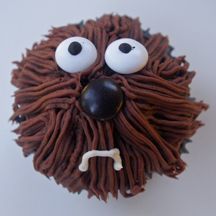 (Remember, multi-opening tip #233 is great for making animal hair or grass.) 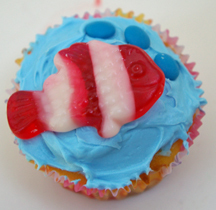 Consider a from-scratch icing recipe, because homemade icing is often thicker and easier to control than canned frosting. What You Need: 1 cupcake; white frosting; frosting tinted green; frosting tinted yellow; frosting tinted black (or premade in tube); metal tips; pastry bags; couplers. 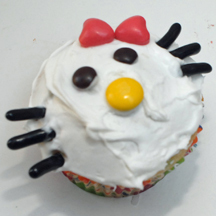 How to Make It: Frost cupcake white. Use large metal tip to “flow” green icing in shape of dragon. Taper off at tail by reducing the pressure as you squeeze. Pipe yellow points for spikes and two yellow dots for eyes. Add black pupils to eyes. So simple, yet they still make a statement. Turn the mouth up more for a more-traditional smiley, or even include sad faces if you’re so inclined. 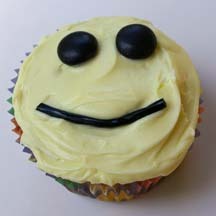 What You Need: 1 cupcake; yellow frosting; black M&Ms; black licorice strings (or black writing icing). 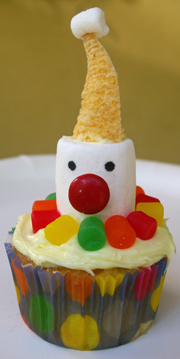 How to Make It: Frost cupcake. Add eyes and mouth. That’s it!